The Motor City’s most amazing wartime production miracles, and how they helped topple Hitler. Dwight Eisenhower, the Supreme Commander of the Allied Expeditionary Force, would never forget the moment his boots hit the sand during Operation Overlord—the D-Day invasion of Normandy in 1944. Shortly after the landings, Ike toured the beaches, which were littered with broken, bullet-pierced vehicles. 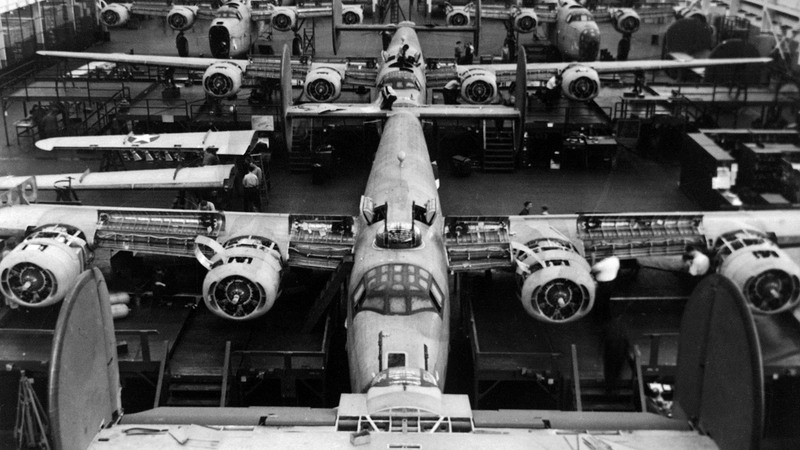 It looked like a junk yard of dead machinery—yet also, proof that the war was being won by the soldiers of the American workforce, on assembly lines thousands of miles away. War is about valor, heroism and sacrifice. But the story of victory during Operation Overlord, and the broader war, is also one of industrialism. World War II was, in large part, a contest between the Allies and Axis powers to dream up ingenious war machines and mass produce them with unparalleled speed. The D-Day invasion, for example, utilized some 50,000 vehicles of all types, well over 5,000 ships and more than twice that number of airplanes. There were amphibious trucks, tanks, four-wheel-drive troop transporters, flame-throwing armored cars, jeeps, fighter planes, bombers… No entity did more to produce that machinery than the American automobile industry, which at the time of World War II, had a larger economy than almost every foreign nation on earth. Think about it the next time you’re sitting in your idling vehicle—about the contribution American car companies made to saving the world from Hitler. Here’s a look back at the most amazing stories that made Detroit the biggest war boomtown of them all. Edsel Ford (Henry Ford’s only son) and Sorensen were the driving force behind the most ambitious industrial adventure in history up to that time: to build a factory that could turn out the biggest, most destructive bomber in the American arsenal, the B-24 Liberator, at a rate of one per hour. Ford had never built a four-engine bomber, and aviation experts insisted it could not be done. By 1945, Ford had succeeded in building Liberators at a rate of one-per-hour. The company turned out a total of 8,685 B-24s. Because of Ford, the B-24 is still the most mass-produced American military aircraft of all time. 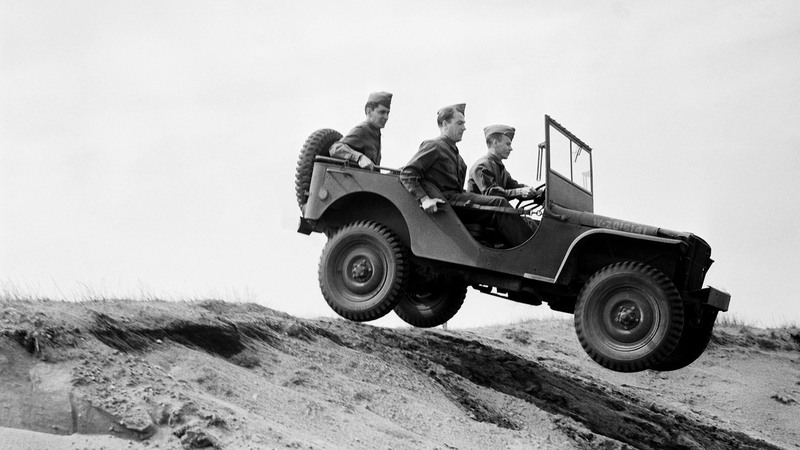 Of all the vehicles built during WWII, none is more iconic than the jeep. Its story begins like this: In 1940, the Army asked car companies to come up with a design for a lightweight (2,175 pounds or less), four-wheel-drive vehicle that could be mass-produced and essentially take the place of what horses had been in warfare for centuries. The vehicle had to conquer all kinds of terrain, and it had to be able to carry a 625-pound load. Three companies built prototypes: Willys-Overland, Ford and Bantam. The first two went on to make some 660,000 “blitz buggies”—Willys built 376,397 and Ford, 282,352. 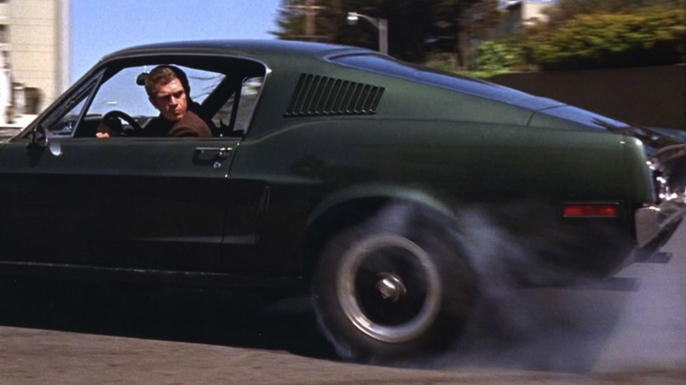 Because the vehicles by both had to use interchangeable parts, they were very similar. Miraculously, the first jeep that Ford constructed—GP No.1 Pygmy—still exists; it’s on display at the U.S. Veterans Memorial Museum in Huntsville, Alabama. In 1940, William Knudsen telephoned K.T. Keller, the chief executive of Chrysler, and asked him if Chrysler could build tanks. “I don’t know,” came the answer. “I’ve never seen one of these things.” Soon after, Chrysler broke ground on what would come to be known as the Detroit Arsenal Tank Plant, situated in what is now the suburb of Warren. Its goal: to build swarms of tanks according to auto-making mass production principles—something never accomplished before. 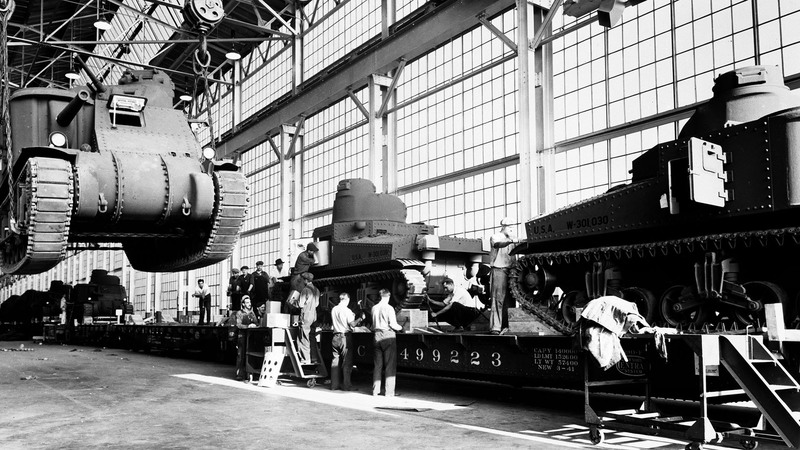 Even before the factory had been completed, the first Chrysler M3 tank rolled off the assembly line. The walls of the factory were not even up, so engineers brought a steam locomotive in to keep the place warm for the workers during Michigan’s bitter winter of 1940-41. As the factory swelled to 1.25 million square feet, the company switched to M4 Sherman tanks, which were powered by a Frankenstein of a motor. Engineers took five six-cylinder engines that had been used in the Chrysler Royal and Windsor cars before the war and welded them together into one 30-cylinder motor that could pump 425-horsepower to the tank treads. In the end, the Detroit Arsenal built more tanks than all of the Third Reich during the war years, tanks that roared through enemy lines all the way to Hitler’s Berlin. Perhaps the most extraordinary of all of Detroit’s World War II creations was a strange vehicle that could practically walk on water. The story goes back to 1942, when GM engineers got together with a marine architect and some Army officers to solve a critical problem. The army was planning massive, highly-dangerous amphibious invasions, and there would be no port facilities for the landings. Soon a sketch was on paper for a vehicle that could launch from a ship, part the waves on propeller power, then hit the ground and drive at speeds of 50 mph, with three axles and six wheels (all-wheel drive). 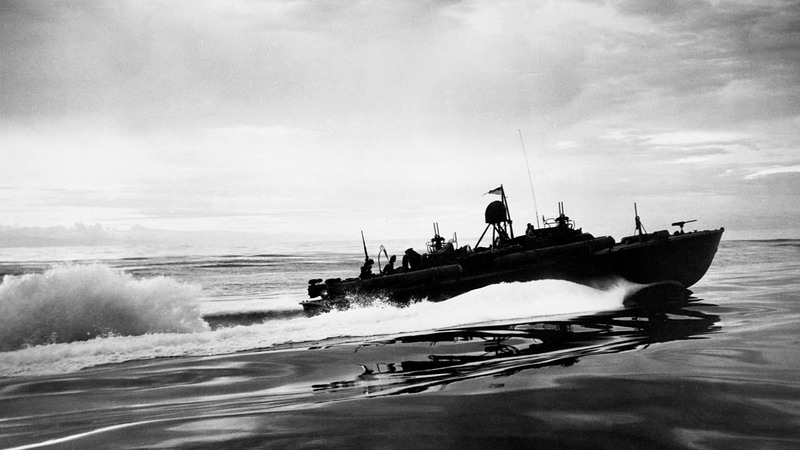 While the vehicle’s technical name was DUKW (in GM’s code, D signified model year 1942; U meant amphibious; K stood for front-drive; W for two-axle rear drive), the thing came to be known as the Duck. GM built over 21,000 of them, at a cost to the government of $10,800 each, according to Michael W.R. Davis’s Detroit’s Wartime Industry: Arsenal of Democracy. 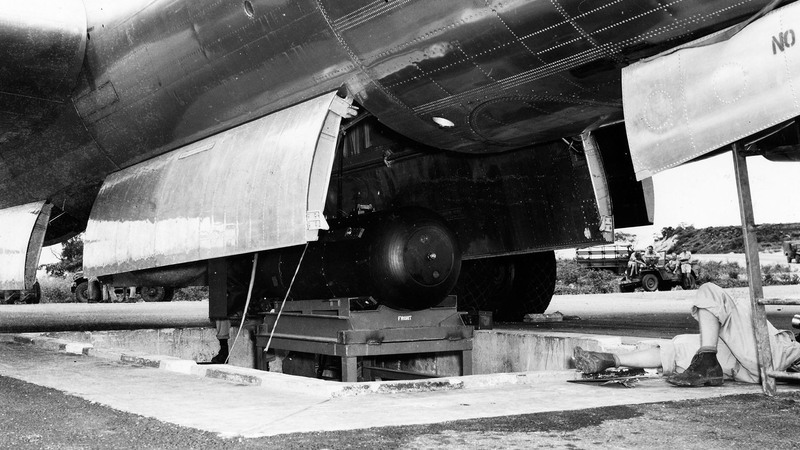 At 31 feet long, the Duck could carry a payload of well over 5,000 pounds. 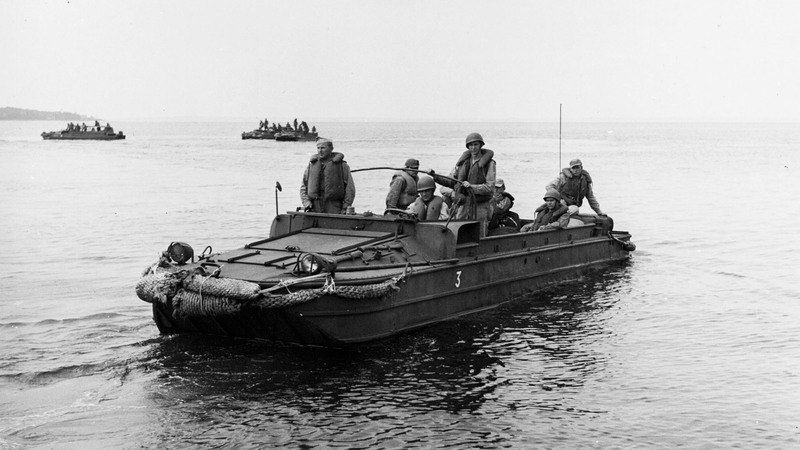 Pairs of them were strapped together to serve as landing craft for tanks. The vehicle made its most noteworthy mark during the Normandy invasion. According to the U.S. Army Transportation Museum, between D-Day on June 6, 1944 and May 8, 1945, Ducks moved 5.05 million tons of cargo onto the continent of Europe. Years earlier, Henry Ford had built a plant in Iron Mountain, Michigan, which he used to turn leftover wood chips from Model T production into charcoal for barbecues. (The brand was originally called Ford Charcoal; today it is Kingsford, the largest producer of barbecue charcoal in the country.) At this plant in 1942, Ford began mass producing a wooden glider called the Waco CG-4A, designed by Ohio-based Waco Aviation. 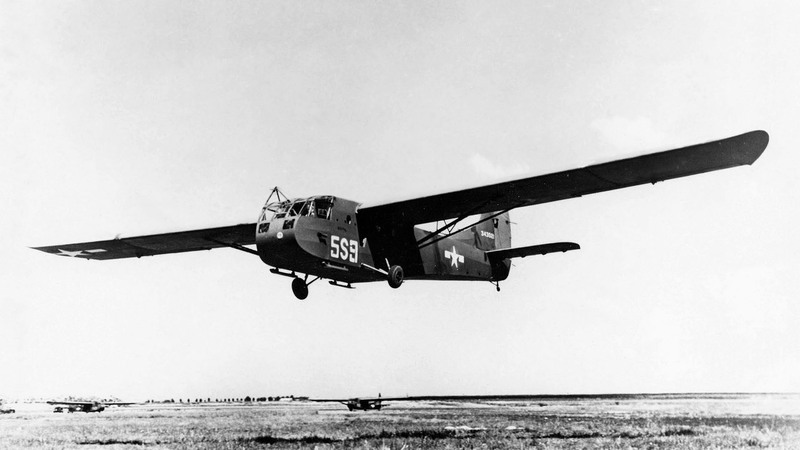 Having never built a glider before, Ford managed to build more of them during WWII, at a cheaper cost, than any other company, and the CG-4A became the most widely used cargo/troop transporter glider of World War II. With a wingspan over 83 feet long and weighing about 7,500 pounds, each wooden glider could carry more than a dozen passengers. It could carry a tank or a Jeep. During the D-Day landings, fleets of these Ford-built gliders whistled engineless over the landing beaches during the pre-dawn hours. A handful of them still exist at the World War II Glider and Military Museum in Iron Mountain, Michigan, near where Ford originally built them decades ago. The Packard Motor Car Company of Detroit had just unveiled the first air-conditioned automobile (“cooled by mechanical refrigeration”) when the Battle of Britain began. 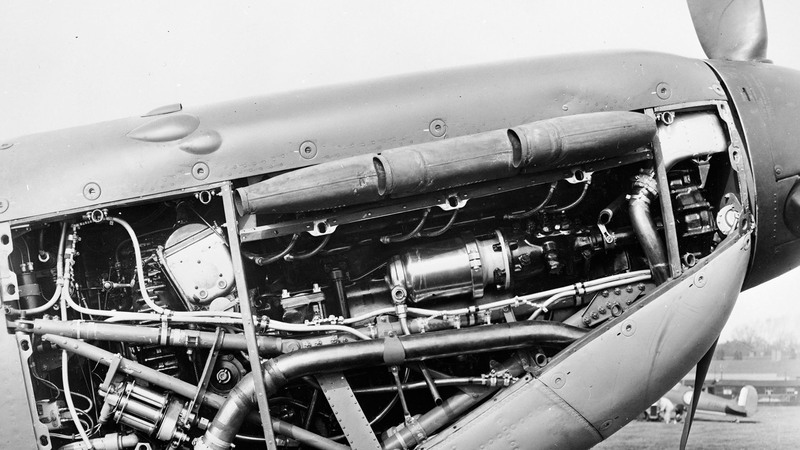 The Brits were desperate for aircraft engines, so Packard took on a contract to build the jewel of the Royal Air Force: the Rolls-Royce Merlin liquid-cooled V12 aircraft engine. This would not be easy. Packard had never built such a complex motor. The Merlin was the size of a coffin, more than 7 feet long. When officials dropped this Packard Merlin engine into the North American P-51 Mustang, history was made. With top speeds of well over 400 mph, the Packard-powered P-51 became what most consider the best overall fighter aircraft of World War II. 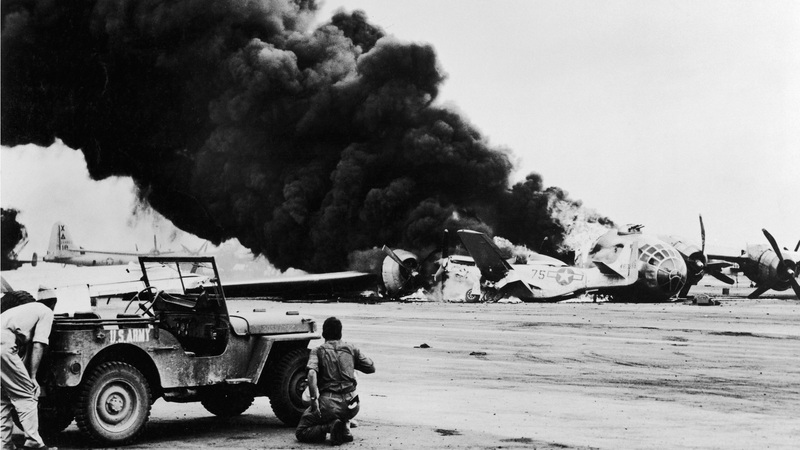 Packard made about 55,000 Merlin engines, and they changed the course of the war. While Detroit’s Big Three—GM, Ford and Chrysler, and their many divisions—were the pillars of American industry in the 1940s, numerous smaller auto companies made major impacts during WWII, companies that are often forgotten today. Nash Kelvinator, builder of Nash cars and Kelvinator refrigerators before the war, made Pratt & Whitney aircraft engines and aircraft propellers. Studebaker made Wright Cyclone engines for the B-17 bomber. De Soto crafted parts for airplanes and anti-aircraft guns, and the Hudson Motor Car company mass-produced aircraft motors. Packard, meanwhile, built V12 marine engines for the Navy’s PT boats, such as the one that powered PT 109, the boat that young John F. Kennedy was on when it was sunk by the Japanese. Pedestrians moving past 1525 Woodward Avenue in Detroit in 1943 might have noticed something odd about the place—an inordinate amount of security surrounding the first floor of an abandoned department store. In fact, something very curious was going on inside. Chrysler engineers had set up offices for something called Project X-100, and FBI agents were patrolling the premises, as the work was so Top Secret, none of the engineers working on the project had any knowledge of what it was all about. 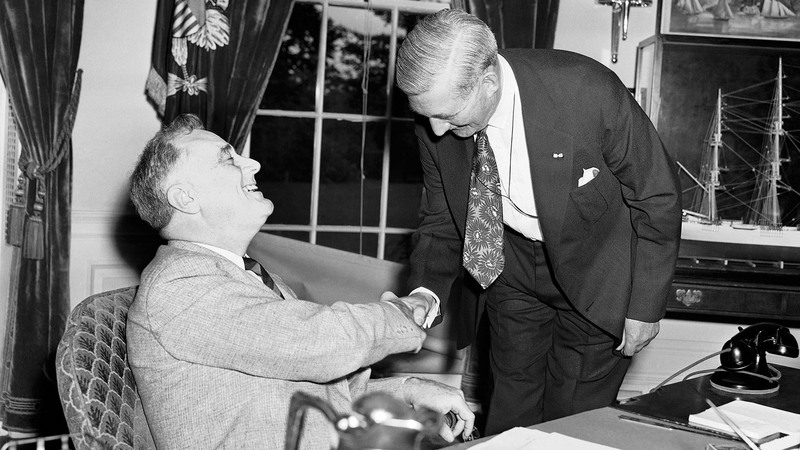 Only the top executives at Chrysler knew that the company was helping to build the atomic bomb. At this laboratory on Woodward Avenue, Chrysler engineers designed diffusers—cylindrical metal containers—that would not corrode during the process of separating fissile uranium-235 from uranium-238, at the Army’s secret Oak Ridge atomic plant in Tennessee. 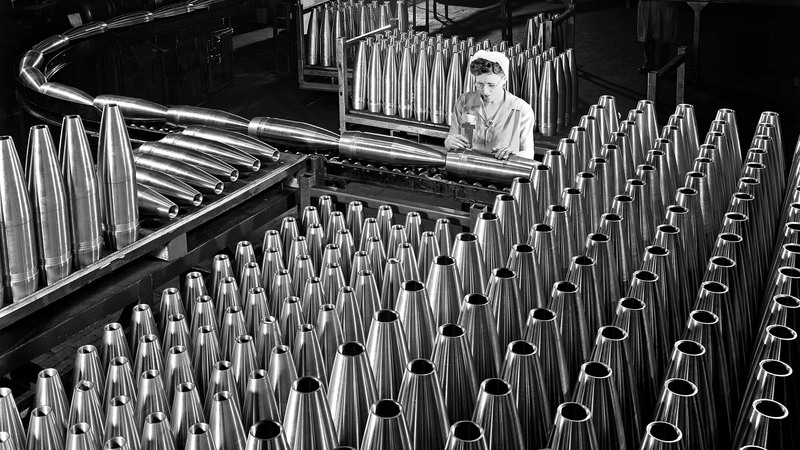 By 1944, thousands of workers at Chrysler’s Lynch Road factory were at work building 3,500 of these diffusers. According to the Atomic Heritage Foundation, these diffusers were so well-designed, they were not only instrumental in building the Little Boy bomb used on Hiroshima, they remained in use until the 1980s. At the time of Pearl Harbor, General Motors had dwarfed every other corporation in the world—by far. And by the end of the war, GM had become the largest military contractor in the world, responsible for more than $12 billion in war production. Tanks were rolling out of GM’s Cadillac factory, where some of the nation’s most luxurious cars were being built just a few years earlier. Oldsmobile had delivered roughly 40 million artillery rounds. Pontiac was building highly complicated Oerlikon anti-aircraft guns. GM’s WWII production numbers (courtesy of the GM Heritage Center) tell the story: 119,562,000 artillery shells; 39,181,000 cartridge cases; 206,000 aircraft engines; 13,000 Navy fighter planes and torpedo bombers; 97,000 aircraft propellers; 301,000 aircraft gyrocompasses; 38,000 tanks and tank destroyers; 854,000 trucks; 190,000 canons; 1.9 million machine guns and submachine guns; 3.1 million carbines; 3.8 million electric motors; 11 million fuses; 360 million ball and roller bearings; 198,000 diesel engines; and more. With the fate of the world at stake, GM played the starring role in the effort to outbuild Hitler and Hirohito. No other corporation, anywhere on earth, at any time in history, ever did more to win a war. A.J. Baime is the author of The Arsenal of Democracy: FDR, Detroit and an Epic Quest to Arm an America at War and the forthcoming The Accidental President: Harry S. Truman and the Four Months that Changed the World.